The heads in the mapcell is used for single part objects or the head piece for multipart. The easiest way to think about it is that the heads contains the map information as specifically sent from the server. For the heads value, the size_x and size_y represent how many spaces (up and to the left) that image extends into. The tails are values that the client fills in - if we get a big head value, we fill in the tails value so that the display logic can easily redraw one space. In this case, the size_ values are offsets that point to the head. In this way, the draw logic can look at the size of the image, look at these values, and know what portion of it to draw. Definition at line 49 of file mapdata.h. Definition at line 58 of file mapdata.h. Referenced by mapdata_animation(), mapdata_bigface(), mapdata_clear_old(), mapdata_clear_space(), mapdata_scroll(), mapdata_set_anim_layer(), mapdata_set_check_space(), and mapdata_set_face_layer(). Definition at line 54 of file mapdata.h. 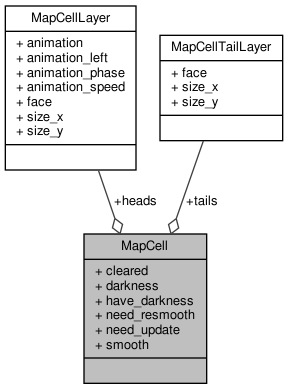 Referenced by mapcell_draw_darkness(), mapdata_clear_old(), mapdata_set_anim_layer(), and set_darkness(). Definition at line 56 of file mapdata.h. Referenced by mapdata_clear_old(), mapdata_set_anim_layer(), mapdata_set_check_space(), and set_darkness(). Definition at line 51 of file mapdata.h. Referenced by clear_cells(), drawsmooth(), expand_clear_face(), expand_clear_face_from_layer(), expand_need_update_from_layer(), expand_set_face(), mapdata_animation(), mapdata_bigface(), mapdata_can_smooth(), mapdata_clear_space(), mapdata_face(), mapdata_face_info(), mapdata_set_anim_layer(), and mapdata_set_check_space(). Definition at line 57 of file mapdata.h. Referenced by expand_clear_face(), ExtSmooth(), gtk_map_redraw(), mapdata_set_smooth(), and mark_resmooth(). Definition at line 55 of file mapdata.h. Referenced by expand_clear_bigface(), expand_clear_face(), expand_need_update(), expand_set_bigface(), expand_set_face(), gtk_map_redraw(), mapdata_clear_space(), mapdata_newmap(), mapdata_scroll(), mapdata_set_anim_layer(), mapdata_set_check_space(), mapdata_set_face_layer(), and set_darkness(). Definition at line 53 of file mapdata.h. Referenced by drawsmooth(), ExtSmooth(), mapdata_can_smooth(), mapdata_set_smooth(), and mark_resmooth(). Definition at line 52 of file mapdata.h. Referenced by expand_clear_face(), expand_set_face(), mapdata_bigface(), mapdata_face_info(), and mapdata_set_check_space().